We recently enjoyed a visit with our daughter Ainsleigh who travelled to Hong Kong from Canada right after her spring university exams. 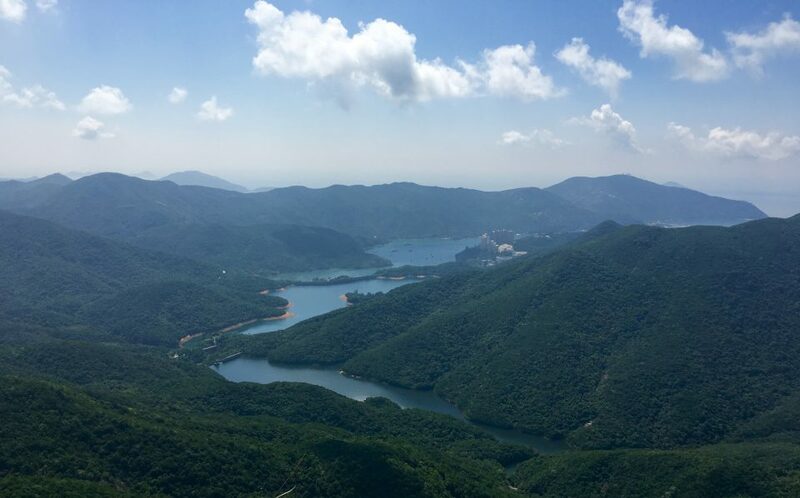 We made a short trip to China while she was here, and while it is not my intention to make this a travel blog, I did want to share a few thoughts about the trip. This was the first excursion to the mainland for Ainsleigh and me. Paul has been to a few Chinese cities previously on business. The three of us started our vacation together by taking a 1.5-hour flight to Guilin in Guangxi province, then driving about 75 minutes south to Yangshuo County. Yangshuo is an area famous for its karst peaks. I had always thought that those ink sketches of mountains in China were just stylized mountain images, but they’re not. They are the real thing in this area. 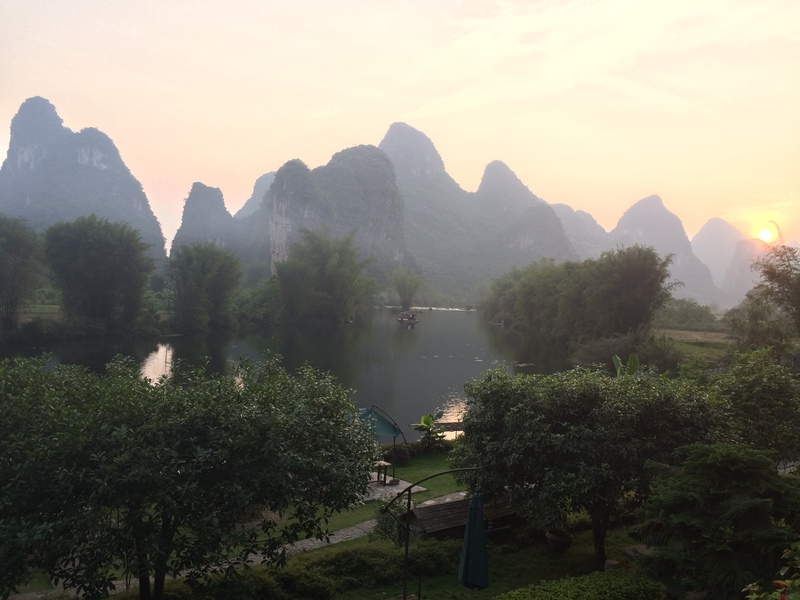 We stayed at a wonderful place called the Yangshuo Mountain Retreat about which I cannot rave enough. It is a small lodge right on the Li River, very peaceful and scenic and such a great escape from the cities in this part of the world. While it was easy to just sit in their lovely gardens and make sure the river kept flowing, there was actually quite a lot to do. Ainsleigh went rock climbing in one of the best climbing areas in China; we saw a terrific light show performed on the Li River with the mountains and sky as the natural backdrop; the two of us took a tai chi lesson; I had a massage; and we enjoyed watching hordes of tourists floating down the river on bamboo rafts. We went for a walk through some nearby villages and saw just how “basic”, shall we say, village life can be. Many, many unfinished buildings and houses, little or no electricity, litter everywhere, piles of old building materials, helter-skelter streets and housing and shops. Were it not for the natural beauty of the area, there wouldn’t be much to recommend it. We were a little surprised when children would come up and just stare at us, women would point us out to their children, and the men openly ogled Ainsleigh (mom was not amused by that). We never felt threatened though, and we had a nice time shopping for painted paper fans and ink paintings in the city’s old section (Fuli has a history of about 1,000 years). That’s a small pig in his basket. After three days in Yangshuo, Paul returned to Hong Kong and Ainsleigh and I continued on to Beijing. We had a driver and a personal tour guide for our three days there, which was a really good way to do our first visit there. We hit all the main sites including Tiananmen Square, the Temple of Heaven, and the Great Wall which was truly a thrill to see. We also visited the Summer Palace where we were swarmed by Chinese tourists wanting their picture taken with us because we were white. Coming from multi-cultural Canada, it was such a surprise to realize that many people in China have never seen white people before. Our 15 minutes of fame! I think we could have charged for this! There is a band shell at the Summer Palace where seniors gather to sing folk and civic songs, guided by a conductor and accompanied by a small ensemble. There was this lovely old man with one tooth who spoke very good English and showed us their singing charts, which are different from Western music notation. But the place where I had the most trouble was the Forbidden City. According to our tour guide, about 70,000 people go through there every day. While waiting for our guide to get our tickets, we did our rock-star thing and obliged the Chinese tourists taking pictures with us (!!! ), then headed through the main gate. Right at that moment, some guards came along and pushed everyone from one side of the site over to the other, funnelling everyone to a much smaller area. This meant that all the people who would normally fill that vast site were being confined to less than half of it. We were told later that some dignitaries were visiting and that on such occasions they will close off part of the site. Now, I have never had a problem with crowds here in Hong Kong, probably because they are orderly and quite quiet, but in China, the crowds are way more aggressive. There was a sea of humanity moving up those staircases, along with plenty of pushing, shoving, poking and shouting. I threw a few elbows myself. There was no crowd control, no guides to help organize people, no security. It felt so eerie, and I told our guide to get us out of there. These guys could really use some lessons on crowd management and customer relations. You can see the vast area that was cleared and all the people being funneled to the right. What could possibly be gained from a visit like this to a national monument?! Overall, I would say that Beijing is not a lovely place. And you really cannot see the sun. It feels perpetually hazy because of the air pollution and everything seems bland and gray. I was quite glad to come “home” to Hong Kong which seems positively glam in comparison. So that’s a bit of my first dip into the vastness of China. I’m not sure I would go back to Beijing, but if I did, I would pick one or two things and focus on them. We’ve come to realize that when you want to get away here, you have to get on a plane and leave the country because there isn’t anywhere to go by land except mainland China. We are going to try to travel to as many places as we can in this part of the world while we are living here, and I think that Vietnam is next on the agenda.